Indigenous polygalas are easy-to-grow, low maintenance and water wise plants that provide a dazzling display for many months of the year. 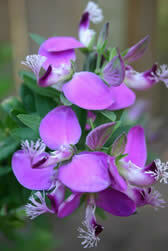 There are about 600 Polygala species that occur in temperate and warm regions all over the world. Of that, 88 species are specifically indigenous to southern Africa, occurring mainly in the fynbos region of the Western Cape. Three of these plants – Polygala myrtifolia, Polygala fruticosa and Polygala virgata – have a long flowering season which has made them popular garden shrubs. With the recent surge of interest in water smart gardening they are now firm favourites with eco-conscious gardeners. This evergreen shrub bears pretty mauve flowers on and off throughout the year with a peak in spring, hence its common names Augustusbossie and September bush. The flowers are carried in small clusters at the ends of short branches and look a bit like legume (pea or bean) flowers, but are actually quite different. The showy petals, beautifully marked with darker veins, are usually in shades of mauve or purple, but can also be pink scarlet, or white. Under favourable garden conditions it can grow into a small tree of about 3m, but it more typically forms a shrub 1,5-3m tall, depending on the local climate conditions. The leaves are green except the white flowered Polygala myrtifolia ‘Feathers’ which has grey leaves. The September bush tolerates both moderate frost and windy coastal conditions as well as periods of drought. Similar in every way to P. myrtifolia but only grows to 1-2m tall. This slender evergreen shrub looks like a fountain of purple flowers when it is in full bloom from September to February. Because it is such a slender shrub it is ideal for small gardens. In large gardens it gives a better effect if it is planted in groups. 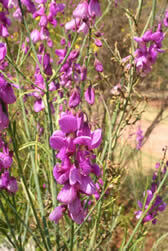 Purple broom grows to a height of 2m. A single stem is formed at the base of the plant and slender leafless branches occur at the top. The leaves are narrow in shape, and dark green with a velvety texture. Once established it will tolerate fairly heavy frost and drought. Plant in soil that drains well. Plant in full sun for best effect, although they will tolerate partial shade. Once established and with a thick mulch covering the soil, polygalasneed very little watering. Polygala myrtifolia responds well to light pruning, which encourages a more bushy shape, but it is not necessary to prune if its full height and shape will not cause a problem in the garden design. Propagate from cuttings or watch out for seedlings that appear beneath the shrub. Use in the low water usage area of your garden. Use in difficult areas of the garden that change from full sun to semi-shade with the seasons. Plant at the back of a flower bed. In a new garden plant September bush as a fast-growing windbreak hedge. 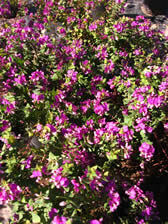 Use purple broom as a container plant.